I grew up calling sherbet "sherbert," which is apparently incorrect. According to Grammarist, the original Turkish word from which the English word is derived is more similar to the word "sherbet." So TJ's got it right. But I didn't. I was so distraught at being wrong (something I'm certainly not accustomed to), that I decided to drown my sorrows in a sweet dessert. Even though it was a painful reminder of years of mispronunciation and misspelling, I reached for this stuff. And let me tell you it's so friggin' good, I forgot all about the whole "sherbet/sherbert" debacle. This is probably the second best Trader Joe's brand frozen dessert we've ever had—right after the Lemon Triple Ginger Snap Ice Cream. TJ's is very good at these creamy, fruity, frozen things. 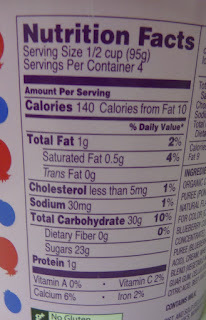 And more good news: this stuff isn't even that fattening. It's sweet and sugary, but what sherbet isn't? It's more refreshing in extreme heat than thick, lard-laden ice cream with chocolate goodies, and it's way creamier than the cheapo store-brand sherbet from other grocery stores. Plus, it's got real fruit chunks, and it actually tastes fruit-juice-based. Sonia and I polished it off on the same day we opened it. We fought bitterly over the last few bites—got into a sort of spoon-fight duel. We compromised and shared it and have since made up. Thanks for your concern about our marriage. It's light and fruity, yet somehow thick and creamy at the same time. Perfect for hot, humid August weather. It's conceivable that some would want to pass on this item if they're not fans of blueberry or pomegranate, but Sonia says she thinks it tasted like raspberry. 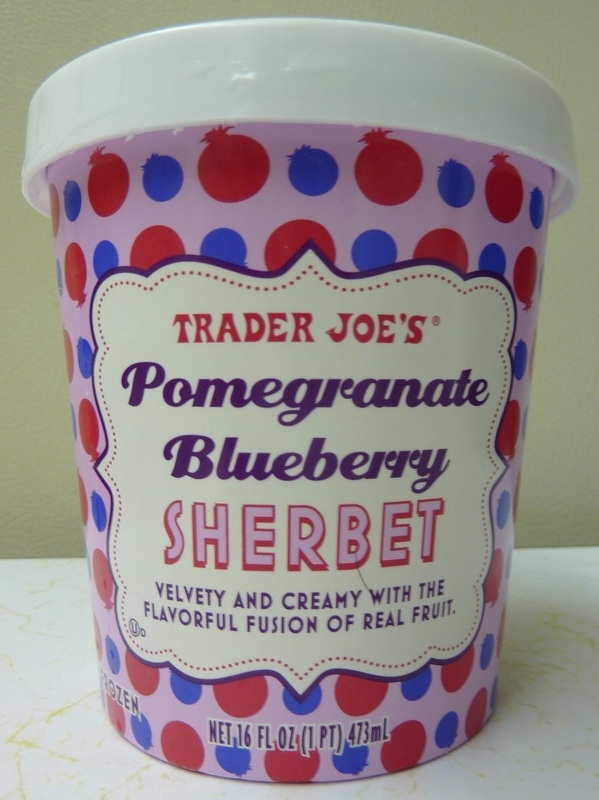 I'm with TJ's on this one—"pomegranate blueberry" seems as accurate a description as any, with maybe a slight emphasis on the blueberry. But we both agree it's good. Really darn good. Double 4.5's, for Sonia and my highest score since April and a very near miss on attaining Pantheon status. Can you please include the ingredients in your nutrition facts shots,as you did for the Shrimp Fried Rice,or as a separate picture? A lot of T.J.'s products that sound delicious include xanthan gum or guar gum or some other gummy food stabilizer mouth-feel product to which I am sensitive. I realize xanthan gum is organic, but the exudate of the bacteria that causes black rot on broccoli is not a food product I wish to ingest. And what's with the guar gum in T.J.'s olives? Olives have been eaten for thousands of years without guar gum. Thanks! Hi. 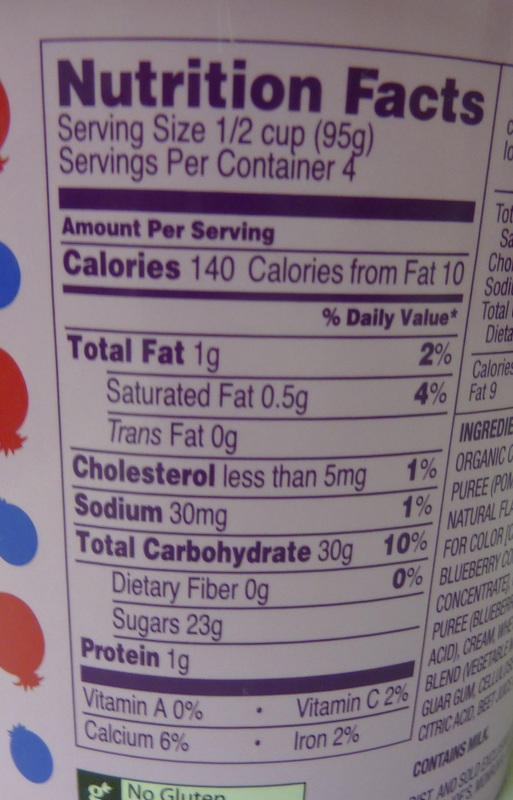 We'll do our best to include the ingredients in the nutrition fact pics. :) Unfortunately we don't have an answer to your olives question. I'm sure TJs would have some idea about it.